Entire stretch of DNA required for production of enzyme is called Operon (Operon which controls the lactose concentration in bacteria is called Lac Operon). In bacteria, the expression of gene is controlled at transcription level. Operon model of gene expression was first described by Francois Jacob and Jacques Monod in 1961. 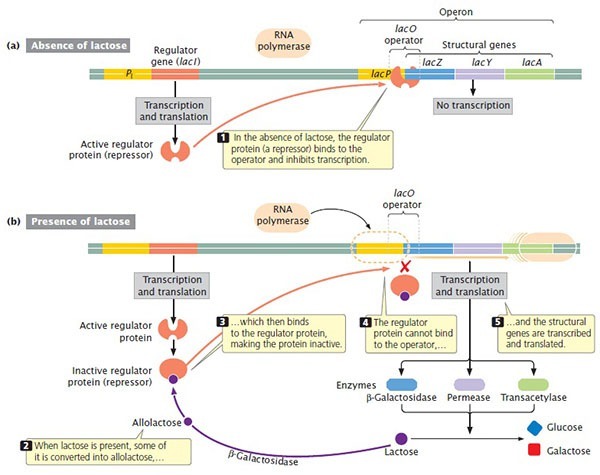 The Lac operon is involved in both negative and positive control of gene expression. There is following mechanism of negative control of lac Operon in E. coli bacteria. E. coli bacteria live in the gut of man. Lactose sugar is present in milk. Lactose is also available to bacteria if host (man) drinks milk. Bacteria break down this compound in its body for energy requirement. An enzyme Beta-galactosidase is required for the breakdown of lactose. If lactose is available to bacteria. It synthesizes this enzyme within 15 minutes. The gene of beta-galactosidase is part of operon called Lac operon. It also includes two other structural genes required for the metabolism of lactose. 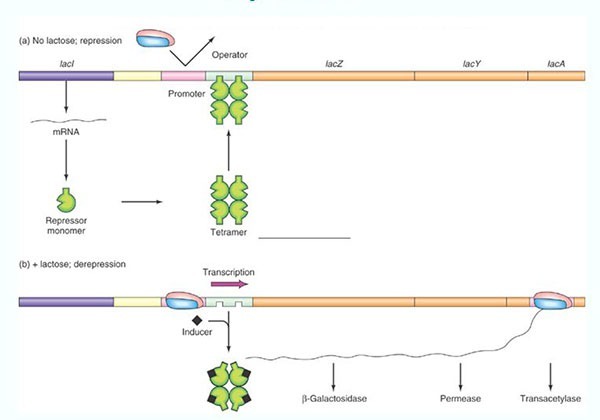 The entire operon is under the control of single promoter. Another regulatory gene is also present outside the operon. It codes for a repressor protein. A specific metabolite inducer inactivates the repressor. The inducer is allolactose for lactose. Allolactose is an isomer of lactose. Absence of Lactose: The allolactose is in an inactive state in the absence of lactose. Therefore, repressor attach with the operator. Hence, lac operon remains non-functional. Presence of Lactose: If lactose is added, allolactose become active. It binds to lac repressor and alters its configuration. Now repressor cannot attach with the promoter. Now RNA polymerase can attach with the promoter. Transcription starts and mRNA is produced. This mRNA is transported to ribosome. Ribosome synthesizes beta-galactosidase. This enzyme breaks the lactose sugar. The first preference of bacteria for energy requirement is glucose. It uses lactose only in the absence of glucose. Positive control of gene expression in lac operon occurs by CAP (catabolite activating protein). CAP accelerates transcription of lac operon. CAP attaches at the CAP binding site of promoter. It helps in attachment of RNA polymerase at promoter. Thus, CAP stimulates the gene expression. So, this mechanism is called positive regulation. Absence of Glucose: CAP is sensitive to glucose requirement of cell. There is shortage of ATP in bacteria in absence of glucose therefore, AMP changes in to Cyclic ATP (cAMP). The cAMP accumulates in the cell. CAP has binding suite for cAMP. Thus, CAP-cAMP complex is formed. It attaches with the promoter and stimulates the transcription of mRNA of beta-galactosidase. Now this enzyme starts breaking lactose. Presence of Glucose: Now if glucose is added, the concentration of cAMP falls. Thus, CAP molecule detaches from the lac operon and transcription stop. Thus, although lactose is present, but glucose is available to bacteria. So, it does not waste energy in breaking of lactose. Thus, synthesis of ß- galactosidase is stopped.